Are you planning a trip to Longboat Key? You’re going to have an amazing time! Whether you plan to go there as a day tripper or stay on one of the many pristine resorts, you’ll have the experience to write home about. Longboat Key is home to 6,000 residents, most of whom are retirees. However, the key has hosted many retired celebrities there for vacation. Keep your eyes open while on vacation to see who you can see! Relaxing and upscale, Longboat Key is perfect for the individual or family who wants a true beachfront vacation rental getaway. Off the coast of Florida and in the Gulf of Mexico, it remains easy for vacationers to get to but also feels secluded. In Longboat Key you’ll be able to leave your worries behind on the mainland and drift off on the city’s gorgeous white sand beaches. If you’re traveling to Longboat Key, it’s expected that you’ll want some time at the beach. There are public and private beaches for you to enjoy with your spouse, significant other or family. Most of the beaches on the key are private. Private homes and resorts that line the oceanfront restrict access to residents or guests of the resort. Casa Del Mar provides its own access point for beachgoers. It sits directly on the ocean, and many of the rooms we offer have views of the sea. We also have a pool on site so you can go from the controlled atmosphere to the beach in a matter of moments. If you’re not staying with us, or you want to venture out to another beach, there are 12 public access points on Longboat Key. You can find most of them on Gulf of Mexico Drive. There are three located in other places: 100 Broadway Street, 7055 Seabreeze Avenue, and 100 North Shore Road. There are restaurants nearby and some local amenities. However, there is no lifeguard on duty at these public beaches. There are also no changing rooms or bathrooms, so plan ahead when visiting. You cannot bring pets or alcoholic beverages on public beaches. Also prohibited are bonfires, overnight camping and any special events (without prior approval from the city). You also may not golf on the public beaches. However, there are several golf courses on the key if you’re a fan. There are a couple of beaches located near Longboat Key that aren’t on the key itself but are still close-by. Beer Can Island is a public beach and island that is almost exclusively reached by boat. With its pristine beaches and laid-back atmosphere, it gives off a deserted island vibe. You can reach Beer Can Island by foot during low tides. It is a popular party spot for locals and vacationers alike. Coquina Beach is off the northernmost part of Longboat Key. At 1.5 miles long, it is popular with families and people wishing to spend the day at the beach. The beach’s popularity is, in part, because of its huge picnic area. Coquina Beach provides showers, restrooms, sand volleyball, grills, bike racks, trails, a playground, and sells some concessions. Close to Longboat Key is the city of Bradenton Beach, on the southern tip of Anna Maria Island. With four miles of public beaches and several nearby cafes available, it is also a popular choice for locals and vacationers. People who love to fish can buy bait on Bradenton Beach and fish at the pier. Currently, Longboat Key boasts four golf courses. As the key is popular with the older crowd, golf is a big activity in addition to tanning at the beach. One of the favorite golf course to our hotel guests is the gorgeous University Park Country Club. With 27 beautiful holes, it caters to golfers of all skill levels. It’s consistently voted one of the best golf courses in the Sarasota region, and for good reason. Links on Longboat is the newest golf course. It had an overhaul in 2014, with a design by Ron Garl. It has over 6,700 yards of beautiful greenery and natural wildlife, along with superior ocean views. Links on Longboat holds a par of 71 but has five different tees to accommodate a variety of levels. While you may find more of what you’re looking for on the Florida mainland or on nearby St. Armands, there are still several shops on the key. On the north of the island are the Centre Shops of Longboat Key. This plaza contains the Chamber of Commerce, in addition to a UPS store and a tutoring center. It is also home to a variety of boutiques that you can browse at your leisure with one of a kind items. Shoppes of Bay Isles sits on the north of the island. It contains a nearly 50,000 square foot Publix, one of the few in the United States of its kind. The Publix contains a hot bar, cold bar, Pacific Wok station, and a wine-chilling station. The Publix also has a large prepared food section that includes everything from Chinese to rotisserie chicken, though it can be a bit more expensive than food found on the mainland. The Publix is convenient for those who want to find a quick bite to eat before making their way to a nearby beach for a picnic. The Shoppes of Bay Isles also includes a pharmacy, a nail salon and a dry cleaning store to keep you in perfect health, both inside and out. St. Armand’s Circle, located on the island of St. Armand’s below Longboat Key is where most people go for their shopping. It is a fully stocked luxury shopping center that meets most of your needs. Shoppers can dip into local boutiques and souvenir shops. They can also enjoy familiar luxury stores like Lily Pulitzer and Tommy Bahama. There are several restaurants located at St. Armand’s Circle to keep your belly full as you browse. In addition to the expected seafood fare, you also have an Irish pub, a French sweet treat parlor, and two Italian restaurants to choose from. Prices for these restaurants vary by location and are everything from casual dining to a more upscale affair. What’s a vacation without amazing food to tide you over? On Longboat Key, you’ll find foods for almost every price point, and taste bud, to fuel your vacation. For a cheap casual affair, your options are plentiful on the island. Enjoy a relaxed atmosphere with the Longbeach Cafe, Simply Susanne’s Cafe or Cedars Bar and Grill. All family friendly, these options serve standard American fare and have low prices for those who are on a budget. Longbeach Cafe boasts an excellent breakfast that guests rave about. For a mid-range price, you can enjoy seafood, Italian and other continental items. From the Blue Dolphin Cafe to Bayou Tavern, you can find almost anything to satisfy what you’re craving. The island’s mid-priced restaurants run from very casual dining to dining that is a bit more upscale, so have a look at the restaurant before you go. No matter what you choose, you’ll definitely leave the table feeling satisfied. In terms of fine dining, Longboat Key has quite a few upscale eateries to cater to the well-heeled who visit the island. There are four fine eateries for guests to choose from. Maison Blanche boasts a gorgeous French and continental European menu. Euphemia Haye offers both American and European dishes. The Chart House serves up American fine dining as well as seafood, which you might expect. Portofino Restaurant and Grill takes your taste buds to Italy with local seafood blended into Italian dishes. If you want to do something aside from lounging on the beach, shopping, playing golf or eating, there are plenty of other activities to do on the island. There are several nearby companies that offer boat tours. You can see the wildlife from your boat, hear narrated tours, enjoy the ocean breeze or fish! Abbott’s Family Charters’ Captain Greg specializes in bay fishing, but you can also catch a boat to go bird watching. Catherine’s Florida Charters leaves from Longboat Key, allowing you to enjoy time with your family or significant other on a yacht. Experience the wildlife and gorgeous scenery on a charter tour. There are several places that offer kayak tours or allow you to rent one. Almost Heaven Kayak Tours gives you an eco-tour of the Gulf of Mexico. Sarasota Paddle Board Company offers a stand-up paddle boat if you’re willing to give it a try. Sea Life Kayak Adventures offers sea life tours and a glimpse into some of the more sensitive areas in the Gulf. You can also catch a sunset or moonlit tour of the gulf for a breathtaking experience. If you’re interested in diving, Blue Waters Explorers Dive Charters offers you a spearfishing and diving experience. You can also ride on horseback on the beach like the characters on the covers of romance novels, with Beach Horses. Fabio, unfortunately, is not included. If you’ve explored all you can explore on Longboat Key, you might want to head over to Sarasota for the evening or a day trip. A lively city, Sarasota offers live theatre, an opera, a ballet, and even a farmer’s market. Many of the tours of the Gulf of Mexico sail off from Sarasota, so you might have to go there to enjoy some of the beautiful yacht or charter boat cruises and tours. Make the most of it by spending the rest of your day in the city. If you’re interested in history and art, you can visit the Ringling Museum, a nod to the famous Ringling Brothers Circus. However, it isn’t a circus museum but a Sarasota cultural center. It is home to permanent and temporary art exhibitions that take place throughout the year. Not only do they host art galleries, but also provide screenings of various plays and operas, direct from London and New York. Also part of the Ringling Museum is the Ca’ d’Zan, a mansion that was once home to John and Mable Ringling. The venue is a nod to the 1920s era of opulence and decadence, as they built their circus empire. Sarasota is also home to a variety of water sports, from parasailing to diving to fishing to kayaking. If you’re feeling extra adventurous, you can even rent a Segway to tour the area. As Sarasota can get hot in the winter, you’ll be able to breeze by the city’s attractions as if you were on foot, but without breaking a sweat. The Segway tours are popular and a great activity you can do with your significant other or family. Whether you’re visiting Longboat Key during the summer months or spending the holidays on the island, there is something for everyone. You’ll have a memorable experience with your family or significant other taking in the views the island has to offer. With amazing restaurants, world-class shopping, and Sarasota only a short car ride away, there’s nothing you’ll want for when on vacation at Longboat Key. 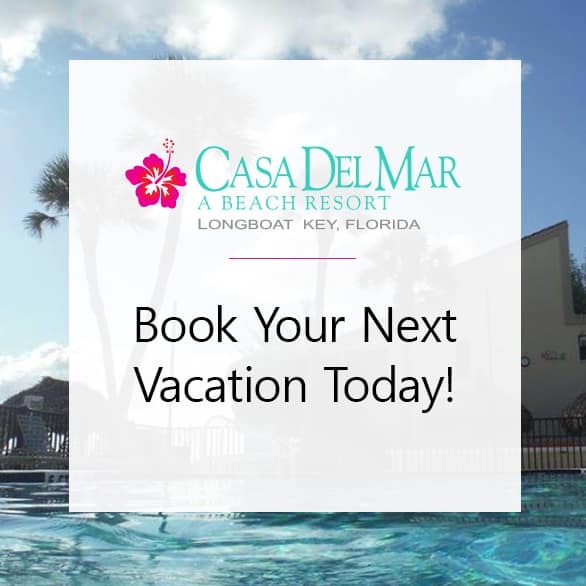 If you’re looking for a place to stay while visiting, Casa Del Mar’s Florida beachfront rental has everything you’ll need to make your visit memorable. Our private white sandy beaches keep you from having to fight the crowds when you want to relax and enjoy some fun in the sun. Every rental includes a full kitchen, two bedrooms, two baths, and a living/dining area. You don’t have to leave the comforts of home behind, just the stress! For more about our hotel and resort, visit our blog. We cater to couples as well as families looking to create a memorable time on the island.